Don’t forget to enter the MKL Designs Holiday Card giveaway! Click HERE. It ends this Wednesday!! Hello. How was your Monday? It’s fun times here, people! Fun times. So… let’s make Monday better, shall we? Have you heard of Gussy? Consider this a warning of extreme cuteness! Wouldn’t these make great stocking stuffers? a $30 gift certificate to her shop! How seriously awesome is that?! 2. Go visit Gussy. Come back here and tell me what’s your fave. 3. Follow Maggie on Twitter. And follow her blog. 5. Blog, Tweet and/or Facebook about the giveaway. 8. Buy from Maggie’s shop before the giveaway is over and receive 5 extra entries! her know you’re from THE BENNER DAILY. 10. Tell me – what do YOU want for Christmas? Thank you Maggie for offering to do a giveaway on The Benner Daily!! You rock! If you’re interested in sponsoring The Benner Daily, we would Love to have you! shops participating in her Online Holiday Boutique! Those are really cute zipper bags. :) Here's crossing my fingers to hopefully win some! Today is my 30th birthday!! Well…besides posting all your photog secrets I like reviews of things mom's use! I like the avocado damask wallet with cumin ruffle. So amazing! I always love great jewelry finds. I love it when bloggers post new things for me to ogle! I want a booklight, camera strap cover, and a copy of "sew liberated" or "knitters book of wool" for christmas! Well, how cute are those little bags! Thanks for the fun giveaway! I would love a new sewing machine for Christmas ….but I will settle for some new Gingher stuff. My favorite thing is the black and white hounds tooth with the blue ruffle. Cute stuff! pick me, pick me. i'm really sick and that would perk me up a tad! My favorite is Gus For Work – Sea Blue with Yellow Plaid Ruffle Work/Laptop Bag. I would love to receive a fabric storage cabinet for Christmas! It does NOT sound like it has been a good Monday at your house. I hate days like that!!!!! Cute little bag by Gussy. peace…not world peace, just family peace. heaping lifetime long peace, that's all. amen. Posted a blog about the giveaway! I like the avocado damask ruffle gussy with the flap. I adore Gussy! In fact, I put one in my stocking this year :-) Would love to get more! I follow her blog and follow her on twitter. I want a new phone for Christmas. CUTE! I know just what I would do with one. I like the Shady Gus – Black and White Houndstooth with Blue Ruffle Accessory Case and the Ruffle Gus – Black and White Plaid Wallet with Pink Ruffle. The sewing related things I would like for xmas are gingher shears, a magazine subscription and quilting supplies as I'm about to venture into my first quilting project! Cute, cute cute! All of them! I just love this giveaway. my favorite is the Lovely Gus – Brown Damask Zipped Pouch with Cumin Ruffle! Hi from Fl, this fine Tuesday morning. I love all things Gussy, so not fair to pick just one! I have been a Gussy follower for some time now! I want a new sling, to carry my ever growing little boy! ooh love the gussy creations!! My favorite is the Lovely gus (brown damask) ooh I so want santa to bring this to me. I left gussy a comment!!! 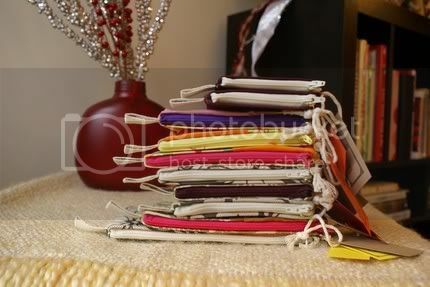 Ooh, I recently discovered Gussy, and I LOVE all of her wallets! Any of the wallets in houndstooth fabric are my favorite!!! I just bought two wallets from her shop last night as gifts, does that count?!?!? Now I really need the $30 because I'm so sad to give these two away, because I really want them for myself! Oh, how I looove Gussy!! I think I've entered every giveaway she's had for a while, and I haven't been a winner yet…keeping my fingers crossed!! I follow Maggie's blog and Twitter! Um, posts? Good question. How are you with photography? Cause I could always use some tips on that! Those are cute little bags! I'd love to have one! I updated my Facebook status about your giveaway. For Christmas, I'm hoping for some iTunes gift cards to go with my brand new iPhone! I went to Gussy's shop. My favorite is the black and white plaid with the light purple ruffle. I love all her stuff! :-) I've been eyeing her clutches for a long time!! Well, I do love to cook – so maybe some of your family's favorite recipes? For Christmas I'm still not really sure what I want. (I know. Crazy.) But, now that I think of it – a serger would be awesome to have! Here's my "just a comment!" I hope I win! My fave is the Ruffle Gus. …and I follow Maggie's blog. …and now I follow your blog! Hmmm…I just started following your blog…so I am not quite sure what I would like to see you post. I want a hippopotamus for Christmas! (Just kidding) My Christmas list: Pioneer Woman's cookbook, anything from Gussy, and my favorite perfume. I'm following Maggie's twitter and blog now. I want an IPOD Touch for Christmas. Gave a tweet on twitter. I LOVE Gussy! She makes the cutest little lovelies! My favorite today is the Ruffle Gus – Black Houndstooth Wallet with the pink ruffle and the yellow button! SO CUTE! I already follow Maggie on Twitter and her blog! I would love to see some no-sew handmade gift ideas! I would love som scrapbook supplies for Christmas. I'm not sure what yet, but I know I would like a few little things! Love Gussy! Another fun giveaway! My favorite Gussy items are the wallets. Ohhhh Thanks for the giveaway! Mass Cuteness! I love the Ruffle Gus – Golden Yellow Plaid Wallet with Green Ruffle. I'd also love a new sewing machine for Christmas. Or… ya know, some shoes. I love her cute bags! Thanks for the giveaway! My husband and I got married this year so this is our first Christmas together. That's gift enough! I like this one "Lovely Gus – Cream Damask Zipped Pouch with Cumin Ruffle (glossy red button)"
i am a follower of The Benner Daily! i'm asking for a sewing machine for Christmas! My favorite one is the one you posted. The houndstooth is adorable!! I like seeing people's real life on blogs. So if I can't say tutorials, then I guess I just like seeing what other people are up to. I am following the Gussy blog. I love her bags!! So cute. Thanks for a giveaway! I love a super cute give away!!! I love the Ruffle Gus – Black Houndstooth Wallet with Pink Ruffle (and yellow button). Way too cute! I would love to see some photography tips of yours. I want a brand new shiny camera lens for Christmas! I love each and every piece that, I want all of them! i love gussy! i especially love her pouches. all i want for christmas is snow! What do i want for Christmas? The Pioneer Woman's cookbook! And some Gussy! my fave item is definitely the Skinny Gus – Floral Print with Lite Pink Ruffle Small Zipped Pouch. And now I also follow your blog! what i want most for Christmas is a sewing machine! LOVE Maggie's blog….thanks for the giveaway! Yellow Houndstooth Wallet with Pink Ruffle is my fav! What I want for Christmas..?. UGGS! Love Gus! I hope I win! My fav is her laptop bags! I want a new handbag and wallet for Christmas. I love the cream damask zipped pouch w/ cumin ruffle! What a great giveaway!! I love her black and white bag w/ the pink ruffle!! And I purchased one of her large bags! I can't wait to get it!! I folow Gussy's blog and her Twitter. I like your blog! I am glad Maggie showed it to us! I want to be with my family for christmas! love your camera straps! so cute!! i follow maggie on twitter…and her blog! 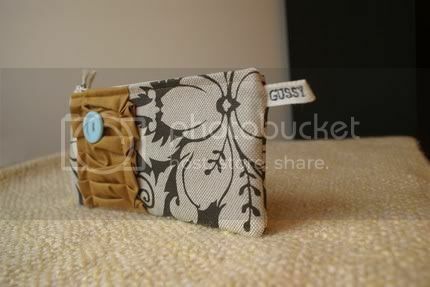 My favorite item is the Lovely Gus – Cream Damask Zipped Pouch with Cumin Ruffle (glossy red button). I love Gussy's shop…great give away!! my favorite item she has right now is the Ruffle Gus – Black Houndstooth Wallet with Pink Ruffle! I seriously like the little Ruffle Gus wallet and might have to shop before this contest is over! I'll let you know! Super cute!! I would love one as a gift for my sister! I am now following Maggie on Twitter. I now follow Maggie's blog. My favorite from the shop is the Cream Damask Zipped Pouch. What do I want for Christmas… a longarm quilting machine… it won't happen, but I can wish, right? Oh pick me, cause I totally want a stocking stuffer…for me! Apple Wallet with Yellow Ruffle is my favorite cause I super duper big heart that fabric! I want a cricut for Christmas and I've been very good cause guess what I'm getting one! They went on a super good sale over Thanksgiving and my husband actually went and got one. I was shocked. Well I would say tutorials but you said not those…maybe some fun stuff you do with your family. I always like learning a little bit more about the person behind the blog. Plus you have gorgeous photography skills maybe some reciepes? Ok! I'm back! I just bought FOUR of her small zippered pouches and have messaged her letting her know I came from your blog! Thank yoU! Oh how cute!!! Count me in. Such cute stuff! Thanks for hosting such a great giveaway! I love Shady Gus – Black and White houndstooth w/ blue ruffle accessory case. I would buy anything with a shock of blue. I already follow Maggie on Twitter AND her blog. All these giveaways are great. Thanks for introducing me to Gussy. 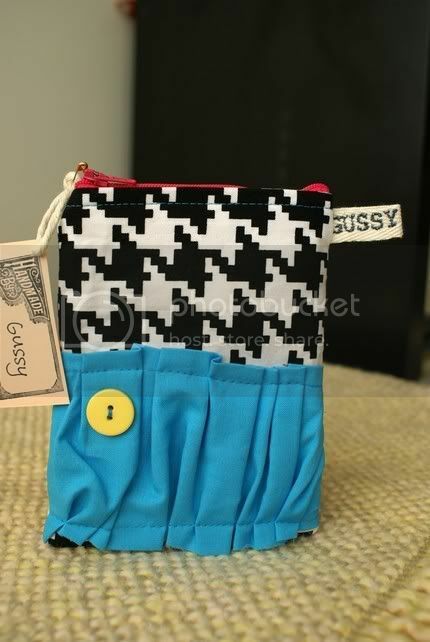 I'm loving Gussy's black houndstooth wallets, but love everything she makes! I follow Maggie on Twitter and am also a follower of her blog. I love the gold and plum mini wallet! So cute! My favorite product of hers is the striped makeup bag. Yummy! !